Smoked Gouda cheese sauce. I mean, come on. My favorite part about Thanksgiving isn’t the turkey, the cranberries, nor the stuffing. It’s the cheese sauce. Oh, you don’t have that on your table spread? Hmmm. It was a staple of my childhood holiday table. Grandma made cheese sauce for nearly every holiday to go on any/all occurrences of broccoli and cauliflower. The boat of sauce was always kept on the Grown Up Class A table, so it seemed from the vantage point of the kids’ table that my desired quantities of cheese sauce were always discordant with the amount I wanted and received. In an act of rebellion and independence, I taught myself to make really good cheese sauce. Then I made it even better. I made cheese sauce with smoked Gouda, sharpened with mustard and Worcestershire sauce. Smoked Gouda cheese sauce may sound like an elevated affair, but the only effort is picking smoked Gouda over plain cheddar at your grocery store, like a toy claw picking a Minion™ over an unbranded, poorly-stitched toy cat. I would be perfectly happy with just a plate of rolls, cheese sauce, and gravy for Thanksgiving. And perhaps a pint of wine. In fact, you could just split open the rolls, pour gravy on one half, cheese sauce on the other, and by golly you’ve got an open-faced Gravy Cheeser. But I am a grown up trying to demonstrate to a small child to try every food equitably, so I prepared this sauce as an application for vegetables. 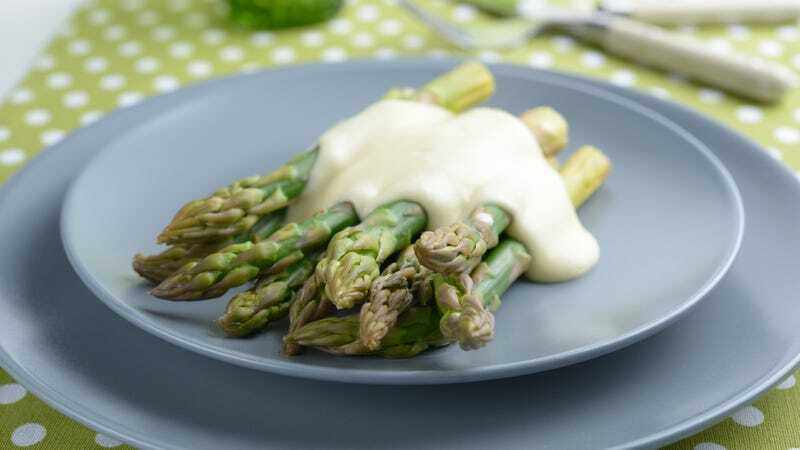 Smoked Gouda cheese sauce is a special friend to broccoli, cauliflower, and even cooked carrots, cabbage, burgers, hot dogs, meatloaf, on and on. Though it did warm my heart that my small toddler person, upon hearing I was making cheese sauce, said “Where nachos?” Where nachos, indeed. This recipe makes a responsible amount of cheese sauce. Eat your veggies, then you can have nachos. In a medium sauce pan, melt butter over medium heat. Sprinkle in flour, and whisk into butter to incorporate. Cook 2-3 minutes to cook out the raw flour taste. Do not let flour take on any brownish color. Add milk and whisk enthusiastically to incorporate milk into flour mixture. Continue whisking occasionally until the mixture begins to thicken, about 3-4 minutes. It should become thick enough to coat the back of a spoon. If is seems to be taking a while to thicken, increase the heat slightly and watch for small bubbles around the edge of the pan. Once thickened, turn off the heat, add cheese, mustard, seasoning salt and a few dashes of Worcestershire sauce. Whisk gently until smooth and silky. Taste for seasoning. Cheese sauce can be made ahead and chilled. Rewarm gently in pan or microwave, whisking in a splash of milk to loosen if needed. What’s that brown sauce in Chinese takeout?